Amateur astronomer Bruce Gary captured this view of the brightening Comet ISON on Nov. 14, 2013, from Hereford, Ariz.
Get ready for a stellar show. The much-anticipated Comet ISON is now visible to the naked eye according to reports from many observers. Comet ISON — the potential "comet of the century" — has suddenly brightened in an outburst of activity with just two weeks to go before it literally grazes the surface of the sun. Comet ISON is now in full outburst mode, becoming many times brighter over just the past few days. Astronomers measure the brightness of objects in the night sky as magnitude, in which the brighter an object is, the lower its magnitude number. The human eye can perceive objects as faint as magnitude +6.5. Photographer and amateur astronomer Justin Ng of Singapore captured this view of Comet ISON on Nov. 4, 2013. If that was a surprise, an even bigger one was waiting for Bortle on Thursday morning (Nov. 14). "Ready to go at 4:45 a.m. but I couldn't figure out what the funny-looking, blotted, star that came into view was," Bortle said. "[Was my] seeing that bad? But, no, the 'blotted star' was, in fact, at the comet's position! Getting to the point, the little but intensely condensed, globular cluster-looking comet was a whopping magnitude 5.4 — two full magnitudes brighter than just 24 hours ago! This makes for a three magnitude total rise since my observation on Monday." In just 72 hours, Comet ISON increased nearly 16 times in brightness. Carl Hergenrother, acting co-coordinator of the comet section of the Association of Lunar and Planetary Observers, has confirmed Bortle's observations. "ISON has dramatically brightened over the past few days," Hergenrother told SPACE.com via email. "The latest observations put the comet around magnitude 5.7 to 6.1 which is a 2+ magnitude increase from this weekend. My own observations from this morning in 10x50 and 30x125 binoculars show a nice 'lollipop' comet with a very condensed blue-green head and a long narrow tail. The tail was over 1 degree in length even in the 10x50s. The comet may continue to brighten as the outburst is still in its early stages." Long Island amateur Dennis Wilde was also impressed by ISON’s appearance in the predawn sky Thursday morning. An hour before sunrise on Monday morning, November 18, catch a sight of the elusive planet Mercury, with brightening Comets ISON and Lovejoy as a bonus. "ISON, while not as large as the full moon, was an impressive sight in the eyepiece," Wilde said. "The coma was compact with a very bright apparent nucleus, very bright green in color. The tail was very thin and bright near the coma and widened slightly as it extended out to almost 3.5 degrees as seen in the 15". It wasn't huge or extraordinarily bright but it was a great view nonetheless. I viewed the coma at up to 490x and it was uniformly dense and bright. There was no indication of the start of any breakup. After finding it with the telescope it was quite easy to pick out the coma with the [binoculars]." This outburst is not completely unusual since ISON has demonstrated short "spurts" of brightening over the past few weeks, but they were quickly followed by abrupt slow-down in its brightening trend. So will the current outburst persist until the comet arrives at the sun on Thanksgiving Day (Nov. 28)? "Whether by chance we have caught the comet at the peak of the outburst is certainly debatable (to me rather improbable) and it may well still brighten further," Bortle said. "The comet may continue to brighten as the outburst is still in its early stages," Hergenrother said. "Whether this outburst will be a short-lived event or the beginning of a more active phase is still to be seen." This sudden upsurge in brightness is certainly very good for a comet that until now seemed to be running well behind in brightness predictions. It seems now that we can feel a little more optimistic about this enigmatic object putting on show for us later this month on into early December. The deep-frozen Comet ISON could blaze spectacularly as it whips past the sun at Thanksgiving 2013. Learn all about Comet ISON's 2013 visit to the inner solar system in this SPACE.com infographic. Comet ISON was first discovered by Russian amateur astronomers Vitali Nevski and Artyom Novichonok in September 2012. The comet is officially designated C/2012 S1 (ISON), with ISON standing for International Scientific Optical Network. The comet is rapidly approaching its Nov. 28 perihelion and as a result it is becoming more and more difficult to observe low near the east-southeast horizon in the dawn sky. Still, observers with access to a clear horizon may be able to follow ISON for about another week. Next Monday morning (Nov. 18), ISON will be passing close to the bright 1st magnitude star Spica in Virgo. Using the handle of the Big Dipper, sweep an arc to the brilliant orange star Arcturus. Then continue that arc on to Spica. 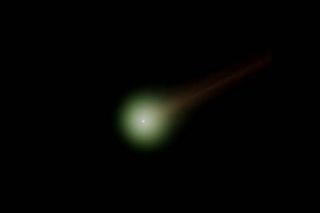 Using binoculars, ISON should still be readily be visible as a fuzzy star with a short tail. Will it still be visible to the unaided eye? Check it out for yourself! Editor's note: If you snap an amazing picture of Comet ISON, Comet Lovejoy or any other night sky view that you'd like to share for a possible story or image gallery, send photos, comments and your name and location to managing editor Tariq Malik at spacephotos@space.com. You can follow the latest Comet ISON news, photos and video on SPACE.com.